Favino vs. Selmer tonal pros&consLet me know what you think! Favino vs the Selmer.... Bracing and woods?? what is the differrence between the Favino and the selmer designs? Does anyone care to share experiences and ideas about the bracing of their mac's... My good friend and playing partner just had his built by Laurence Nyberg and it is exquisite. I have a Gitane and it is much louder than his... I'm wondering if this is due to overbracing on his guitar or what? any ideas? another friend just built himself an f hole with very little bracing...still waitng to hear her. ONE MORE... what is everyones experience with the woods of the guitars.. I like the spruce top and indian rosewood sides... what are the advantages to Koa and maple? any other amazing top woods? why do I see some guitars wiht red tops? is this dyed? I'd love some feedback. thanks a lot. I'm definately no expert in this area but I had the same questions a few weeks ago when I was going to get a luthier-made guitar. Like you I had a Gitane (DG-300) and it was also very loud, louder than every handmade guitar that I've tried. 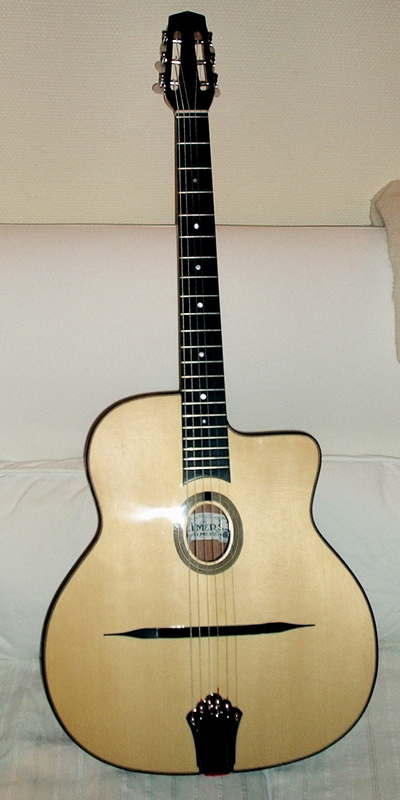 My new guitar is a Quatre-model by Leo Eimers which is based on Jaques Favino guitar, and it has 4 bracings and a wider body than a typical Selmer-guitar. The first thing I noticed when I played it was that it was not nearly as loud as the Gitane but it had a more balanced sound. The top on this guitar is spruce, laminated Brazilian palisander back and sides and the neck is 3-piece flamed maple. I guess the guitars you've seen with red tops if they are new are dyed. I have one experience with other tops than spruce and that was a guitar with cedar-top and it had a warmer and rounder tone. I believe that spruce-tops are the most common for these guitars. I've attached some photos of my guitar. I'm very satisfied with this guitar, both design and sound and would recommend to try a Favino-sized guitar before you order your new guitar. It looks like the favino style has less bracing... and you say it has a wider body? It what way is it wider? ARe these the only characteristics of the favino style? Probably louder wiht less bracing it would seem..
Actual volume is simply the ability to move more air. A thinner top will be louder as will lighter bracing but it's a balancing act. Also, a guitar who's tone has more treble to it will sound louder simply because high frequencies carry better than low ones. Too much treble and the guitar sounds harsh. Favinos have a somewhat larger soundbox and one fewer brace than Selmers. This generally gives you a bit more volume with more bass response. However, the smaller soundhole gives you less ventage for the air moving out of the box. Like I said, it's a balancing act. Each maker uses his or her own experience and taste in balancing the number and size of the braces with the thickness of the top and the design of the bridge. All of these have a big effect on tone and volume. In the end, I guess what you have to do is play the instruments of different makers and go with the one that produces the kind of instrument you are looking for. These days, you can focus more on tone and let an amp take care of volume issues but that's a whole other can of worms. thanks. this brings some clarity to the favino style for me. I need to play some... I live on a small island and playing other guitars is not easy. any insights on the woods? Im interested to hear opinions about koa.. and apalachan spruce for the tops. any insights from those who have played many different woods? Not near as important as the skill of the maker. Also, laminated construction gives somewhat different results from solid wood. Laminated back and sides is traditional on these guitars. As far as spruce goes, I think most makers prefer to use European but that is tradition. I personally like Sitka because it's stronger than some other species and allows for a thinner top all other things being equal. Talk to four different makers and you'll get four different opinions about woods. I think it really comes down to the maker using woods that he or she is most comfortable and experienced with. I've used koa for a number of different instruments and it does fine. Personally I prefer the look of rosewood or maple. Again, it's not so much the wood itself as what the maker does with it that really makes the difference. Sorry I can't give you more definitive answers but this really is an area of taste and preferences. You want something that looks good to you because you going to spend a lot of time looking at it. You also want to select a maker you have confidence in and who's work you admire. I'm not as concerned wiht the look as I am wiht the tone.. I know a lot lies on the top, but Im interested in why some choose koa over rosewood. the builder definately... Ive got one in mind and he's used both.. he thinks koa is a little brighter.. maybe? Im just checking in with the players who've played em all. thanks for the good input. back and side wood won't really make too much difference to tone - the best sounding examples of the two main styles of guitar (the Dupont Vieille Reserve and Favino guitars) both use laminated wood for the back and sides, like the original Selmers. Top material and guitar design make a far far greater difference, as Ken has said, so go with whatever wood you like the look of for the back and sides. I have to say I do think back and side materials make a significant difference in tone. Maybe if they're laminated the difference is less noticeable, but I think solid maple sounds distinctly different from solid rosewood. As for the exotic woods, I think there's something to be said for letting your luthier build within their comfort zone. There might be more risk when working with woods which they use less. I agree. The back and sides do affect the tone. Im just wondering about koa.. anybody?